Support is currently limited to Cree and GE Link bulbs and Wink connected-home hubs. Is Philips Hue next? Lighting-control manufacturer Lutron Electronics announced a new remote control for smart light bulbs Friday, offering initial support for Cree and GE Link LED bulbs equipped with ZigBee radios. Lutron says the remote can independently control up to 30 bulbs, and that as many as 10 remotes can operate inside the same home. We submitted a query to Lutron regarding compatibility with Philips’ Hue LED bulbs, which also use ZigBee radios. Philips recently engendered some controversy after releasing new firmware for its own ZigBee hub that blocked third-party ZigBee bulbs from connecting to it. Philips quickly changed tack in the face of fierce backlash. We will update this story when Lutron responds. You can operate Lutron’s remote in your hand or mount it inside any Decora-style wallplate with an optional mounting kit. The remote is also compatible with the car-visor and table-top pedestal accessories designed for Lutron’s Caseta Pico remote. 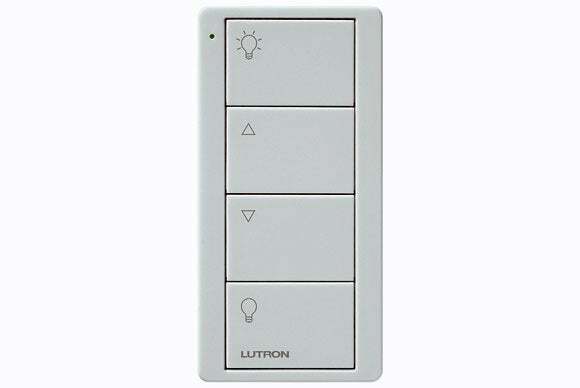 Priced at $30, Lutron’s Connected Bulb Remote Control is relatively inexpensive; that’s about half the price of Lutron's Caseta in-wall dimmer, which must be hard wired and requires the presence of a Caseta hub for wireless control. Lutron says its new remote will be available at Amazon, Home Depot, and Lowes. Why this matters: Most connected bulbs rely on an app to turn them on and off and for dimming (if they support that feature), but it’s not always quick or convenient to pull out your smartphone or tablet just to control a light bulb. And if you’re using more than one brand of connected bulb, each one might require a different app. Lutron’s remote delivers the familiarity of in-wall lighting controls, but it’s also portable so you can use it without needing to get up off the couch. Its ability to control multiple brands of connected bulbs—provided they’re all equiped with ZigBee radios—is another welcome feature.